Being healthy isn’t about reaching a certain size. It’s about adopting concepts such as eating more fruits and vegetables at any size. That’s the message the Oregon State Nutrition and Dietetics Club hopes it left with passersby at this year’s celebration of National Nutrition Month. 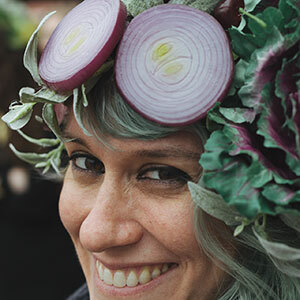 The club hosted a fashion show – Evolve – featuring male and female models of all sizes and nationalities wearing headdresses created from fruits and vegetables. This year, National Nutrition Month coincides with National Eating Disorder Awareness Week, and club officers saw an opportunity to spread an important message. 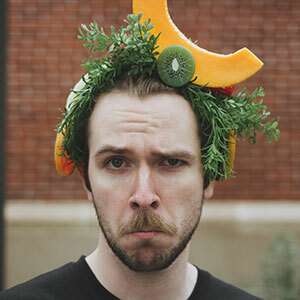 The club’s faculty advisor, Neilann Horner, developed the idea of incorporating fruits and vegetables into the fashion show and Jamie Reynolds-Gordon, the club’s vice president and Emily Sunderman, club member and future vice president, spearheaded its casting and practices. On March 1, Oregon State student models took to the catwalk at the SEC Plaza and showed their colorful creations at three shows throughout the afternoon. Other features of the event included free snacks, prizes, giveaways and tables hosted by on- and off-campus organizations, including Vegans and Vegetarians at OSU, University Housing and Dining Services and First Alternative Natural Food Co-op. The club also brought in guest speaker Amy Esatto, a dietitian specializing in eating disorders from Portland, Oregon, to speak to the university community on February 28. The Nutrition and Dietetics Club comprises 70 members, most of them Nutrition majors, although membership is open to all students. The club’s main focus is on career development and preparing members for their future. In addition to guest speakers, the club brings in dietetics internship program coordinators each fall to help seniors understand the process and answer any questions. More information on Nutrition and Dietetics club and its current officers.